Here on the Costa del Sol it is 20 degrees today and the tourists are out in T-shirts. I dress rather more appropriately to what we call “winter”: a sweatshirt and a scarf tucked away. In Galicia it is not particularly cold, at least not in A Coruña: a very respectable 15 degrees. But the nighttime sees a drastic drop. I can see I’ll be lighting fires in the Casa of the Little Fox as soon as I get there, which is only days away now. Two degrees and no idea where my hot water bottle is. Perhaps 8 klms north from Carantoña is the little fishing village of Camelle. It is remote, even for the Costa da Morte. Were it not for the Prestige oil spill disaster (more on this next blog), I doubt anyone would have heard of it. Even then, it was one of many whose fishermen saw their livelihood covered in layers of deadly “chapapote”: thick oil which devasted the wildlife and paralysed the fishing industry for miles and miles. One resident did not make his living from the sea. In fact, he did not make a living – in the way you and I might consider it – at all. He lived a hermit’s life, tucked away at the end of the road which led from Camelle to the sea. His name was Manfred Gnädinger. Some say he died of a broken heart. Manfred was born in south Germany in 1936. Who knows what brought him to Camelle in 1962, but whatever it was, he stayed until his death in 2002. When he arrived he was well-dressed and clearly educated. Perhaps it was his education which made him seek out company other than the fisherfolk: Manfred fell in love with the schoolteacher, but his advances were not reciprocated and in many ways we might say that this rebuff was the architect of the next 40 years of his life. "I came here and built this to create my own world. I was looking for a place to be alone," Reuters news agency quoted him as saying. "This is my world. I don't think like other people." The people called him simply “O Aleman”, and later just “Man”. Manfred accepted this for the symbolism it represented. He read philosophy, deep ecology. Man was a strict vegetarian gathering what he was able to grow from his garden around the hut. No matter what the season, he wore only a loincloth and swam in the sea year round until well in his 50’s. Not surprisingly, Man became a curiosity. People came from far and wide to visit him, and they were all welcomed, given notepaper and asked to write of their impressions, to do drawings for him. Thousands of these still exist. 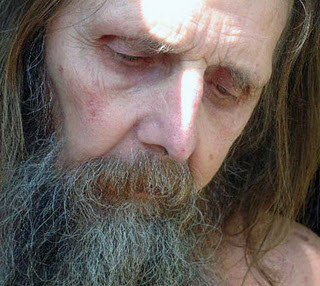 Man charged a token sum for visits to his “museum” and when he died his bank account revealed he had saved extensively. His last wishes are as controversial as he was: in some circles it is said that money was left so that his work and museum could be maintained after his death but to the present day, this has not happened. Other sources claim that Manfred wished his museum to be left as an everlasting symbol of the destruction it suffered as a result of the Prestige disaster. One thing is certain: after a severe storm in 2010, the hut is in disrepair: only a few visitors come to pay their respect to Man these days. But those who do, remember. You see, one morning in November of 2002, Man woke up to find his world covered in oil. The devastation on his face – captured by one intrepid, though rather insensitive photographer – reminds one of Edvard Munch’s The Scream. The realization tore out his heart and left him broken. Man was not a well man by this time: his bronchial system and circulation was dangerously debilitated and no doubt the shock of seeing his life’s work destroyed hastened his end. The pathway to his hut was so covered in oil that the local council gave him a pair of rubber boots, his only other items of clothing. But Man retreated into his house and there, it would appear, simply allowed himself to die of melancholy. His body was found a month after the disaster. Man, the hermit, the visionary, perhaps the mad man..? But who are we to say who is mad and who is not? He was not forgotten by the people of Camelle with whom he had lived alongside for 40 years. The Camelle authorities organised and paid for his funeral, and hundreds of locals attended. Man became a unique human symbol of environmental catastrophe as his body was carried through the streets; even the national papers took up his story. Thousands of birds and fish died in the aftermath of the oil spill, but Man was the only human victim. “Nunca Mais” say the Gallegos: never again. The handling of the Prestige disaster by the government remains a topic of debate. Yet, Manfred’s sizable bequest still sits somewhere in a bank and his legacy crumbles, his statues disintegrate, his garden reverts to the sandy promontory that really it has always been. November 2012 marks the tenth anniversary both of the Prestige disaster and Man’s death. And he is by no means forgotten: even in the press running up to Christmas this year there were articles about him. Man’s story touched me deeply when I was taken to visit his museum first, and even more in the cold dawn of a Gallego December just two weeks ago. You see him there with his bedraggled beard and wise man locks. You see him at work. You see him in despair. Perhaps now is the time for those who have asked for his museum to be restored to have their voices heard. I hope to be one of them. beautifully written. 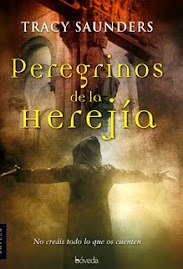 I shared on my Camino Gifts of Friendship group. Hope CHristmas with your family was wonderful. Blessed be! A year and a half after I wrote this blog I am more and more determined to write Man's story: not just Man the artist, or Man the environmental activist but Man the man. I have access to many of his papers, artifacts, letters to and from, but most are in German and many in Galego. The ones in Castellano (Spanish) I can just about handle. It is daunting. But I am determined that Man's legacy will not be forgotten and neither will the sad, sensitive and since man who was Manfred Gnädinger. It might take awhile, but all important things do. I was just thinking about Man today and came across your blog. I was living in Spain when the oil disaster happened and was very touched by his story. Great that somebody wants to write it. Good luck, it's a very noble task. Happy to help out with any Spanish translations if you need a hand! (I don't live in Spain any more but used to translate screenplays when I lived there). Are you ready to go home yet? Post Camino Pilgrim Retreat. Stay 3 - 5 days more and reflect on your Camino. Donativo. 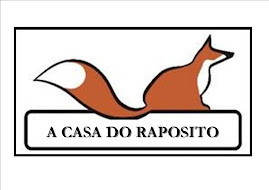 A CASA DO RAPOSITO: "THE LITTLE FOX HOUSE"
This blog features information, news and views about my book Pilgrimage to Heresy.... and reflections on life in these peculiar times of ours. I received my Compostela in 2000 after more than 800 kms walk, and a few more on top of that since then. I am an Educational Consultant and Cognitive Psychotherapist and Hypnotherapist with a Master’s in Philosophy, Psychology, and another in Applied Linguistics, none of which hold the pride of place as does my Credentiales as a Peregrina. 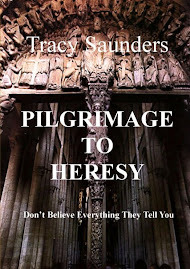 Early Church History fascinates me—the more scandalous the better! I was born in Wroughton, Wiltshire, in England, and after 23 years in Canada, I now call Spain my home.